On July 9, you met our construction site supervisor. Today I would like to introduce you to our night watchman. At least he's as black as night. Here Bro's watching over our new siding. Bro is our good friend John's sidekick. Where John goes, so goes Bro, even during the noise of construction while John builds our new bathroom and porch addition at the cabin. The walls are up. 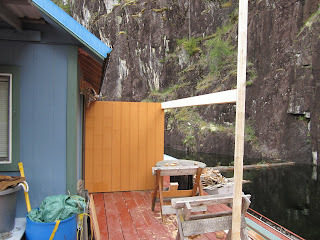 The siding Bro was so carefully guarding is now on the walls and almost ready to paint. Doesn't my new blue roof blend nicely with the existing metal roof? John does such great work. In case we may want to enclose the porch some day to make an additional room, John made that section of roof to the same standard as our bathroom's interior ceiling. Who knows - maybe. The window that used to be in the bedroom is now in the bathroom. Since that made the bedroom so much darker, John created a new larger window for us there as well. Finding a nice day to take our new Bayliner 3058 out has been difficult this summer. But this week, we had two days with sunny skies and calm winds. Our first stop was Lund for fuel (in 2009 we had summer moorage there). Their dock can be a challenge with winds off the strait and lots of boats, but the dock hand handled things nicely. He also said he helped make the flagpole's eagle masthead in a class at school. Lund is a popular stop for boaters heading to Desolation Sound and points north. In addition to fuel, Lund has the Historic Hotel including a restaurant, a small grocery (with lots of supplies boaters need and want), Nancy's Bakery (very popular with locals and visitors alike), and a few other establishments. 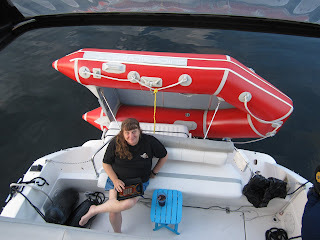 We cruised outside the scenic Copeland Islands and headed straight for Cortes Bay on the south side of Cortes Island. 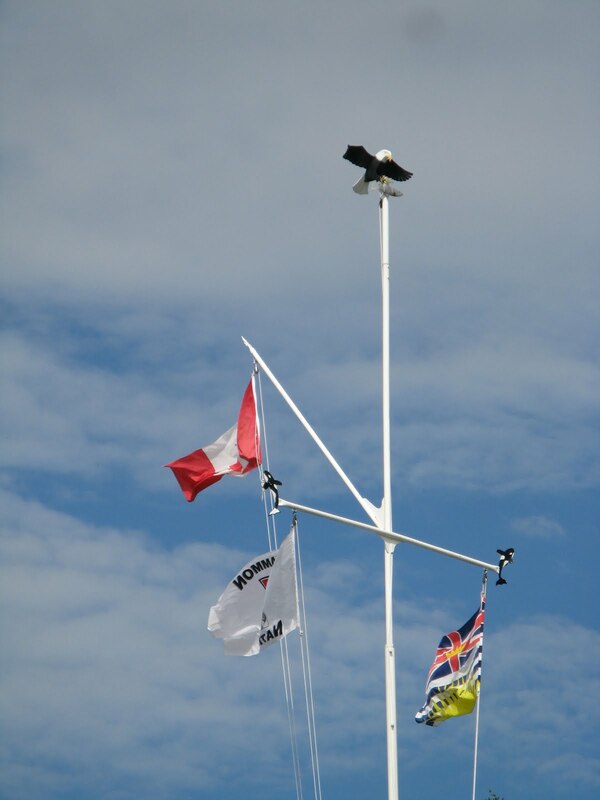 By Coastal BC standards, it isn't very remote (the Seattle and Vancouver Royal Yacht Clubs have fancy outstations here), it is a very protected harbour with plenty of space for anchoring. You will find boats from the most basic to the most ornate within the bay's protective arms. The bottom is a mix of sand and mud, not the best for holding in a strong blow, but none was forecast. Even so, I had my obligatory dragging anchor dream that night. But I didn't let it "Boggle" my mind and enjoyed every bit of July sunshine. This is Sea Fair weekend in Powell River, BC. It is an annual three day event each July. The celebration of our coastal environment starts on Friday evening with opening ceremonies and music, but Saturday is the big day. It kicks off with a parade through downtown starting at 10:00 a.m.
Having a condo on Marine Avenue places you front and center for a great view. Mom and I went downstairs this year to get the best view. Plus we also got the great treats handed out by parade participants: candy, popsicles and even flowers. The Coast Guard is always a big hit, especially since they live in our building. This year I haven't been able to do much gardening up at the cabin. I didn't plant much because we weren't going to be able to be there to do summer watering. Little did I know Mother Nature would take care of that for me. Last summer we only got two days of rain in the month of July. This year it has been just about the opposite. 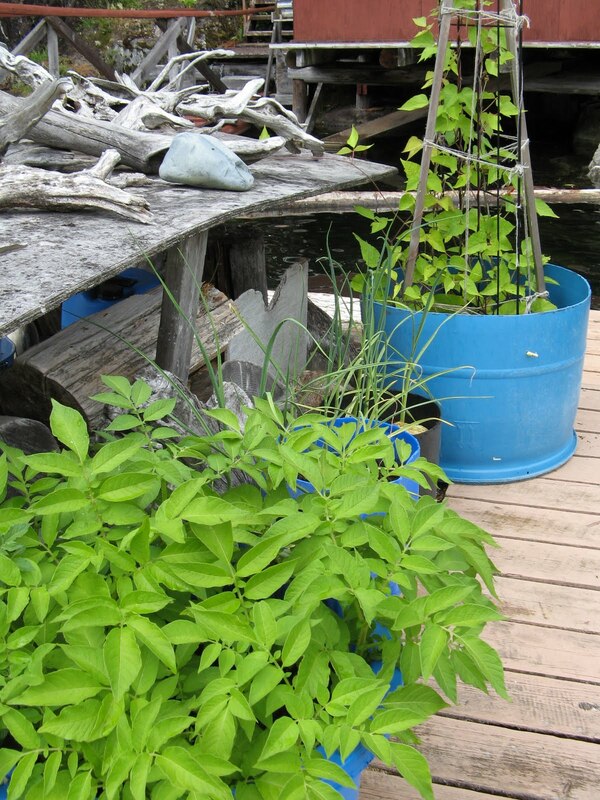 My float garden has onions, one struggling strawberry bed (that needs to come out), my perennial herbs, and asparagus gone to fern. I never got a chance to pull what was left of my carrots from last season, so they've gone to seed. My friend Margaret (at Thistle Garden) suggested I let them go and save the seeds. Why not. I probably won't get another chance. At least from a distance the float looks like it is thriving. On the deck my rhubarb that was doing so well died back to one leaf. I think that's the end of it. Too much rain isn't always a good thing. This year we again had great luck with our visiting Barn Swallows. Thanks to a "helping hand" from Wayne in the form of a support shelf for the nest and a pad on the porch roof for first flights gone wrong. Fortunately, this year the pad wasn't needed except to catch all the droppings under the nest. Here are three babies the day before their first flight. Is that fear or excitement I see in their eyes. The next morning between showers all three little guys took to the skies. But for several days, they returned to the comforts of their nest before heading out on their own. 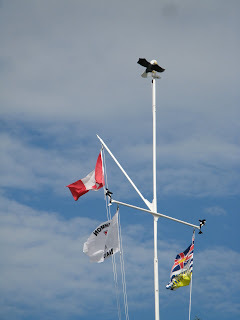 Here's the new "wharfinger" supervising the remodeled North Harbour in Powell River, BC. The saying, "save that nail," has come to symbolize our attitude towards sustainability at the cabin. When we first got our cabin, we were true city-folk. 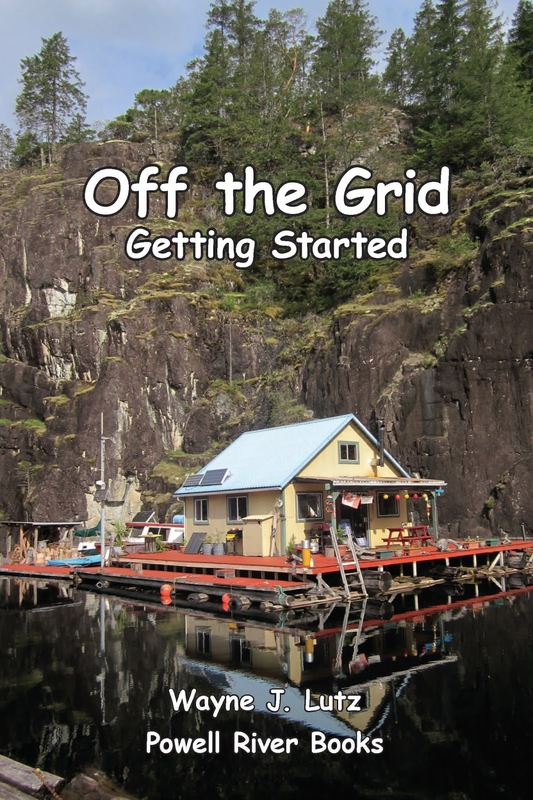 But living off the grid for several years has changed our ways. 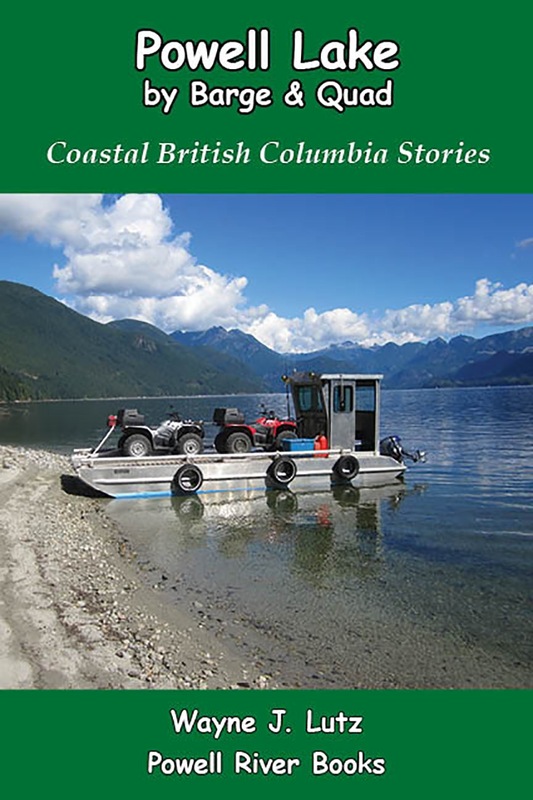 It was such an important concept for us to learn that Wayne devoted a whole chapter to "save that nail" in his first Coastal BC Stories book, Up the Lake. You can take a look here. Everything we need up the lake has to get there by boat, and everything that needs to be discarded has to go down the same way. So you can see, recycling and reusing is really important for us beyond the economic and environmental savings. The Powell River Open Air Market is Back! People living in Powell River have to be just a bit more self-reliant. Even though we live on the mainland of Coastal BC, it's like living on an island. 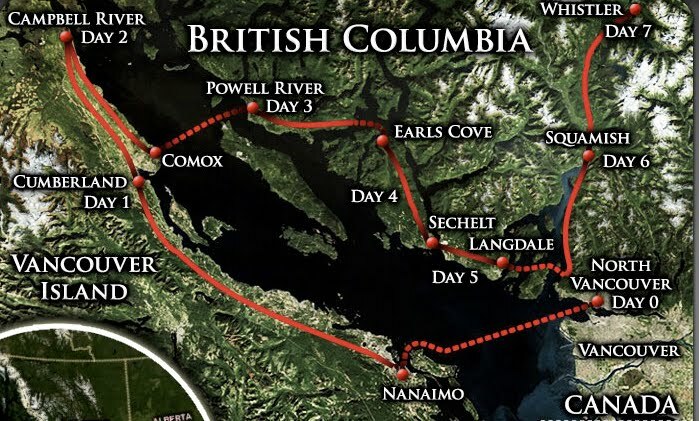 To get to Powell River you need to take a ferry, airplane or private boat. While this does cause some isolation, it also makes our community a strong one. 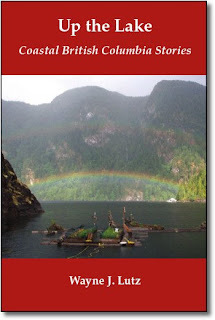 The 50-Mile Diet is a big thing in our town as it is in many places across Canada. People are more concerned these days about where their food comes from and how it is grown. We even have several restaurants in town that serve meals that meet the 50-Mile Diet criteria. How about that? Many people here have backyard gardens. 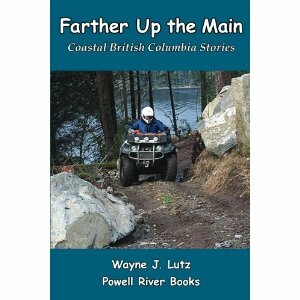 There are also several rich farming areas near Powell River. New regulations, especially on meat sales, make it difficult, but the farmers continue to produce locally grown items for garden gate sales, local restaurants and our weekend farmer's market. The Powell River Open Air Market is held at the Paradise Valley Exhibition Park on McLeod Road each Saturday (10:30-12:30) and Sunday (12:30-2:30) from late spring to fall. In addition to vegetables, you can find fresh baked bread, gorgeous flowers, crafts, guest speakers, good food and great music. 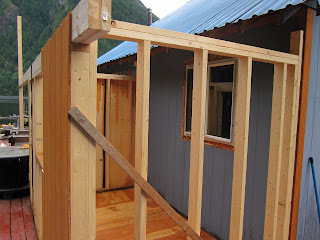 Yesterday I got to go up the lake to personally see how things are going with the construction of our bathroom and side porch addition (also see Under Construction and Up Goes the Frame). I've had some really good help in my absence. 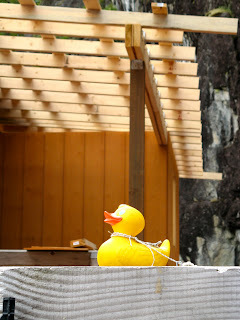 Mr. Ducky has been acting as the site construction supervisor. His report today was that John is doing an excellent job and I'll be "flushing" and bathing in a flash. The walls are all up except for an impromptu opening for an entrance. 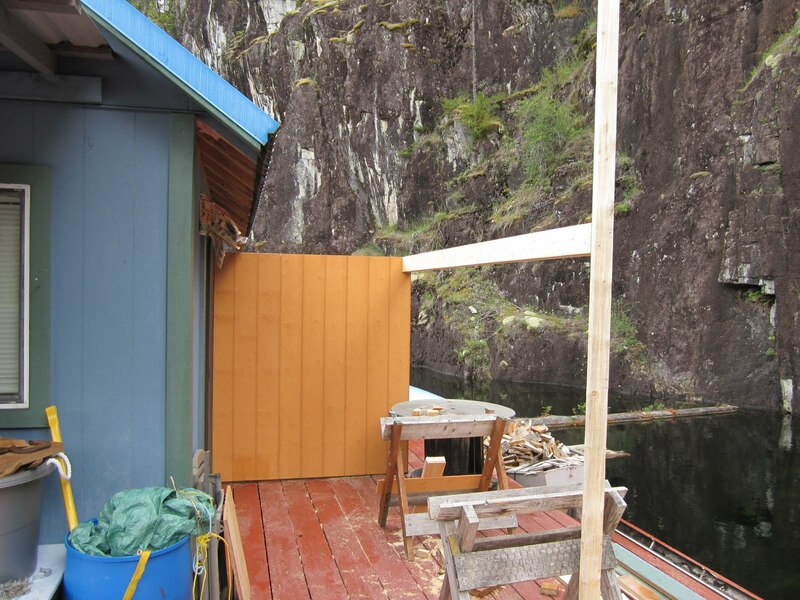 John doesn't want to remove the existing window and open the wall to the cabin until the last minute. Here's the view from the new window placement. Nice! The rafters tying the new roof into the old roof are in place. The perpendicular collar ties will make it even sturdier. The new roof has a shallower pitch so there will be enough head room for Wayne and others over six feet tall. I saw Eddy at Overwaite (I still refuse to call it Save-On-Foods) and he said John has the metal roofing on order. I love living in a small town! The interior seems nice and roomy right now with nothing inside, but I know once the compost toilet, tub and shelves get installed, it will feel a bit smaller. Probably to you, 6'X10' room doesn't sound large, but in a 20'X21' cabin it's all relative. 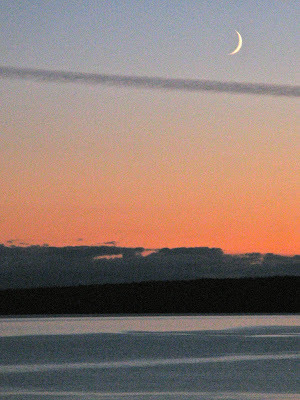 We've had some spectacular sunsets this week here in Powell River, BC. That's because our days have been partly cloudy. 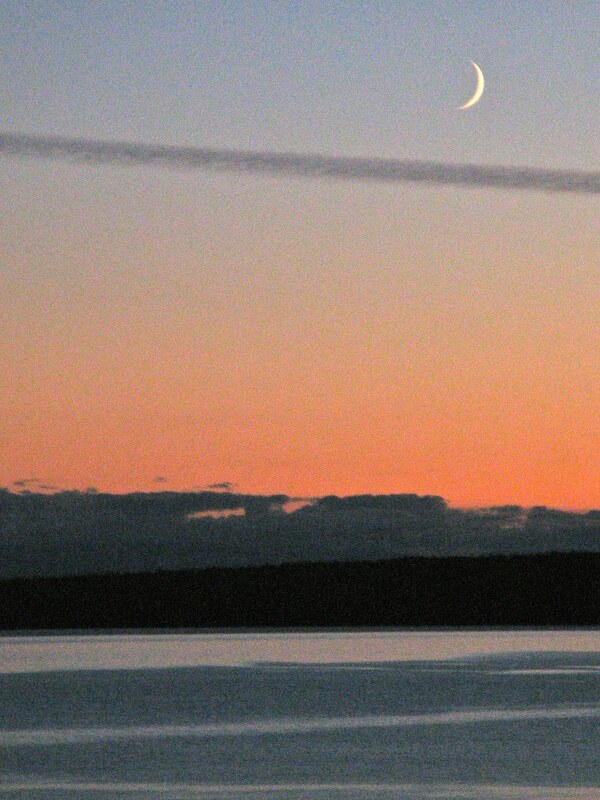 But one clear evening a contrail looked like it was a dynamite fuse igniting from north to south. 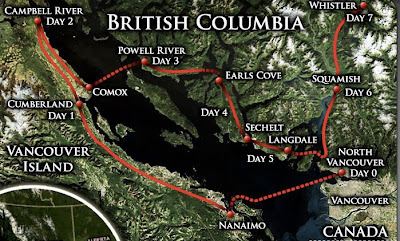 The BC Bike Race came to Powell River yesterday. 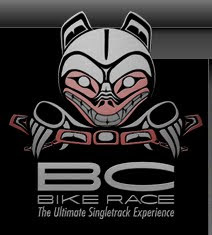 Approximately 500 participants arrived on the Queen of Burnaby Monday night and started the third leg of "The Ultimate Singletrack Experience" about noon on Tuesday, July 5. The race began at Willingdon Beach where everyone camped out for the night. The start followed Marine Avenue (right in front of our condo) then up to Edgehill School to enter the singletrack forest trails. We all went out on the condo porch to see the riders pass. MLA Nicholas Simon handed out free cowbells so racers had quite a welcome as they wound through the streets of Powell River. Here are a few of the bicyclists in action. 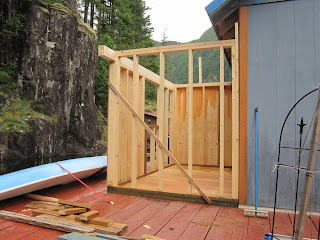 John has started constructing our bathroom and side porch. We chose to put it adjacent to our downstairs "guest" bedroom. That way the deck on the front (sunny) side will remain large. The bathroom will be 6'X10' so there will still be a walk-around deck. That is very important to us. Our deck is our land, and we don't want to lose too much. Inside will be space for a compost toilet, a bathtub (no running water), and storage shelves and cabinets. The window in the bedroom will become a doorway. Then the window will be moved to the bathroom wall. 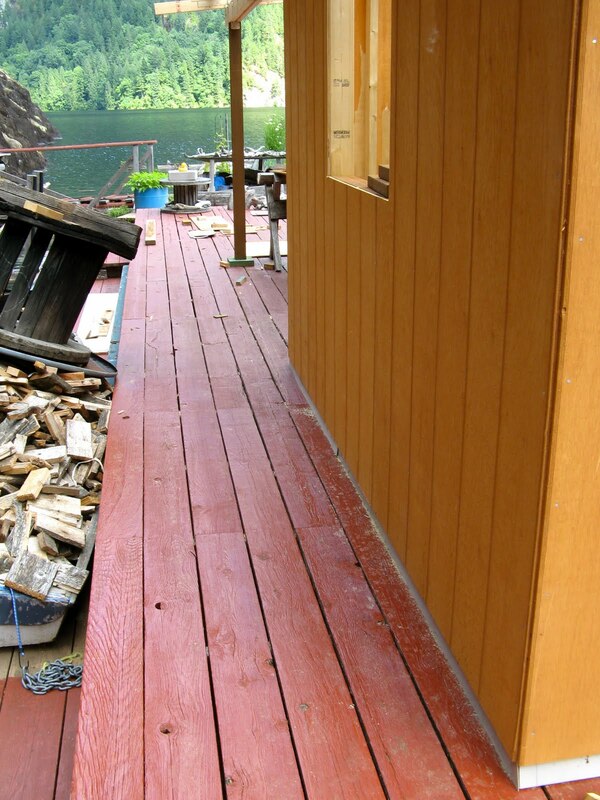 Heavy plywood over the deck is both the "foundation" and the room's future flooring after deck paint is applied. The first phase of construction included framing the walls and installing some of the siding. 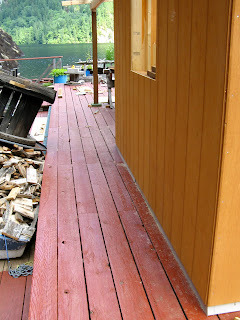 It matches our existing siding and the whole cabin will get a new coat of paint so that everything matches exactly. The post and beam in the foreground are the beginnings of the covered side porch. That will be especially nice on both hot and rainy days. 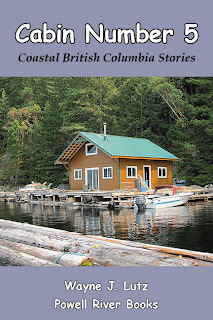 We've lived in our float cabin on Powell Lake since 2001. In the beginning, while we were still working in Los Angeles, it was holidays and summers. After we quit our jobs (that sounds better than the "R" word), we spend about 75% of the year up the lake. We love to watch the seasons change and enjoy winter almost as much as summer. 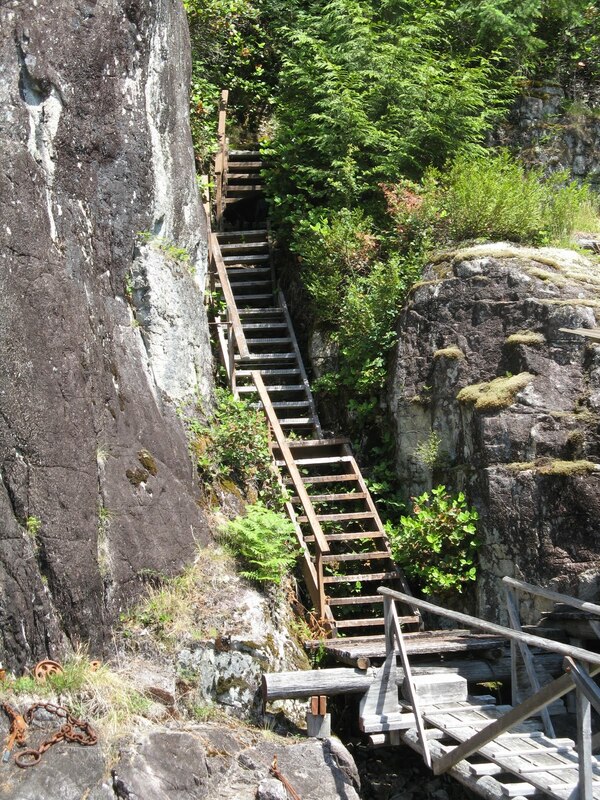 Well, there's one thing we don't enjoy during storms, the climb up to our outhouse on the cliff. Yes, it has a nice view, but when it's wet, cold, and dark, it isn't my favourite place. John built our cabin and we purchased it from him. Since then he has become a very good friend and has helped us immensely with cabin maintenance and projects. I went to him with an idea and a request. BUILD ME A BATHROOM! John took the concept to his dad. Eddy loves to develop plans using SketchUp on the computer. Here's his animated rendition of my new bathroom and covered side porch.